Students of the University of Nigeria Nsukka, UNN, woke in the middle of the night to find their roof blown away by heavy winds. 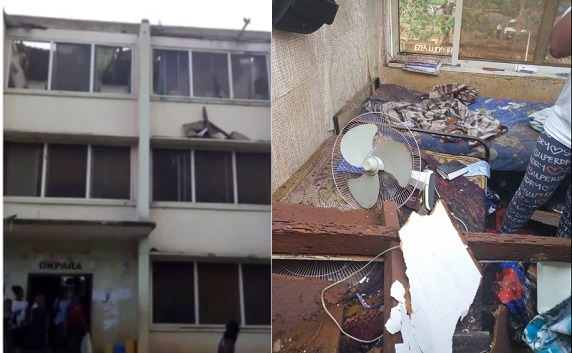 The students who lodge in Okpara hostel where the disaster occurred said the incident happened at about 12am this morning. The roof was blown away while the woodwork caved in, falling on beds and properties of students. Luckily, no life was lost, though some students sustained injuries. As the roof was gone, rain fell freely into the rooms on three hundred series, damaging their properties and wetting their beds, so they had to go look for other places to spend the night. Electricity also had to be disconnected after electric shocks were reported following the incident.